Date of entry of March 8. 2012. 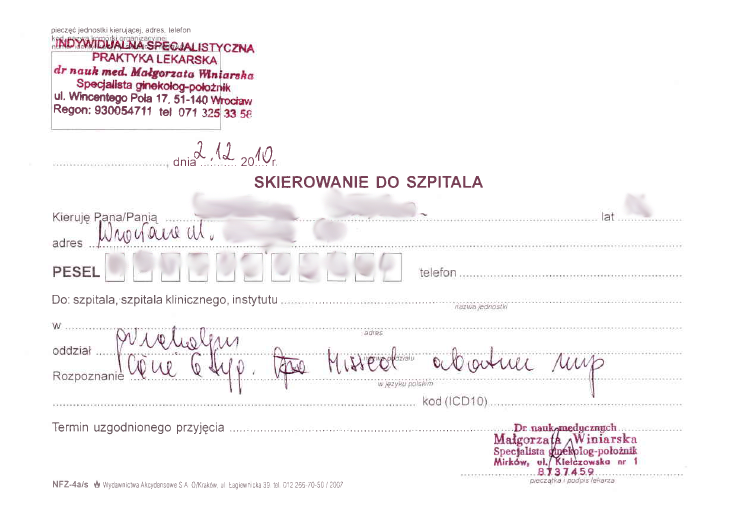 A lady in the 6th week of pregnancy, she went to the gynecologist, Dr. Winiarska on ul.Wincentego Fields, Wroclaw, who is a doctor who did her ultrasound and diagnosed and declared that "the the fetus is dead and must be removed ", and wrote her a referral to the hospital for an abortion to remove" dead fetus, "according to her medical opinion. Proof - a mistook document referrals for abortion, which is attached at the bottom, plus ultrasound on the right. But for sure, come again to study, in a few days, the lady came again and made a Doctor of Medicine Second fetal ultrasound, and confirmed his previous diagnosis that "the fetus is dead and has to remove the fetus abortions in the hospital." Evidence - Second ultrasound - attached at the bottom of the left. Sadly, the lady told me this, I told her that I am better than ultrasound machine, and everything will be fine, it will be a boy, of course, the child (fetus 6 weeks) to live not to worry, and for sure as I do not believe let him go to another gynecologist, just not the same. She went to another and another as the title of Doctor of Medicine said the opposite opinion .... that "the fetus is alive, beating heart, and it is good." Note, the fetus was not removed, and the child lives as it predicted a boy, is now 7 months, today weighs 9.2 kg, is gay, now crawling (today is 8 March 2012). The child heal and thus is extremely large and grand, larger than the other children, than it is to contact and very intelligent, he sings (blah blah), and repeats the words, not tearful; the lady buys clothes for the baby in the size of 12-month child, because it is so big. For now as I write this on July 3, 2012, the child is already 11 months, weighs 12 kg, height is 75 cm. He begins to speak a word. And this is her mistook referral for abortion.